To bad, no visual yet.... curious how its gona be... with armor or not. It's yellow and red, and has slightly more heads than your average flying mount. Since last build 2 hours ago I got the achievement and the mount. But still currently on the ptr (buid .6.2.20141) flying is not allowed in Draenor or at least I am doing something wrong. The achievement said below: "Rewards: Soaring Skyterror (Draenor flying in an upcoming patch)"
Adding screenshot with the mount. I bloody knew this Blizz will release Rylak Mount! Waiting will be over soon, oh yea! One of the extra rewards for the Draenor Pathfinder meta-achievement! Take special note of the word 'initially' in the quote from the dev watercooler, an indication that this may be a limited time reward. 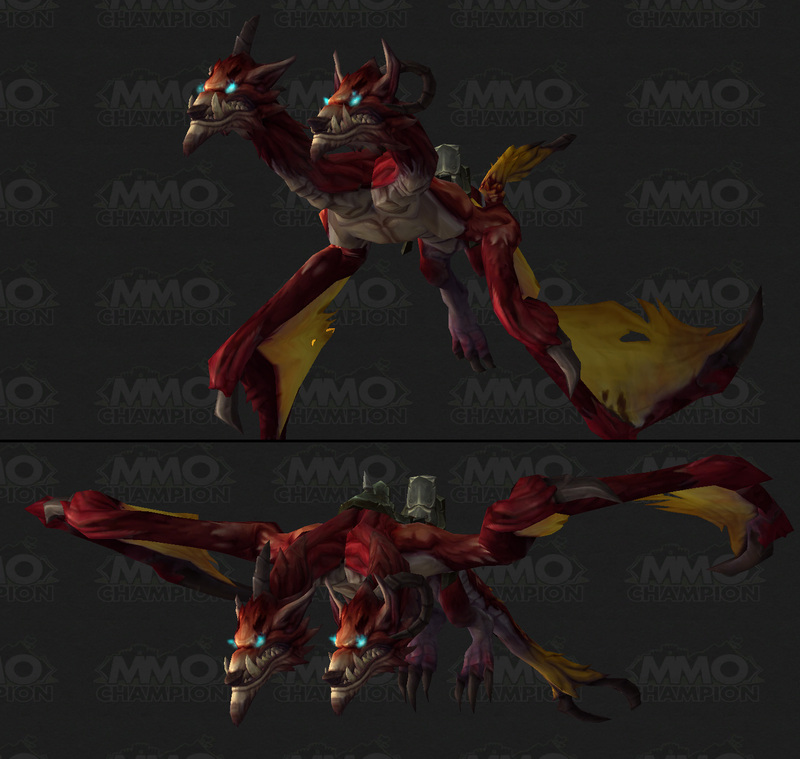 There is also mention of a rylak mount, Soaring Skyterror as an additional reward. The ability to fly will apply to all of your 90+ characters after any one of them possesses all the prerequisites (So, no need to grind reputation on every alt that needs to fly), however it will not appear in 6.2.0 but rather in a later minor patch (referred to as 6.2.x). Cant wait for this. Will make a lot of things easier. Beautiful mount. Although if I was naming it, it would be the Psoaring Pskyterror. Of all the colours of Rylak in the game, this has got to be the ugliest. After all the running around on ground and being sore, we finally get to Soar and Terror the Skies once again! Acquired this mount today after being religious with dailies and getting quite a bit of luck with Medallions. The mount makes rocket noises as it flies despite lacking anything that looks like an engine. Blizzard please. EDIT: As of 6.2.2 the engine sound has been removed. Hooray, another mount that sways back and forth while flying! For all those people that couldn't get enough of their Sky Golem blocking their view of what was ahead of them. Ok, I'll come out and say this: This mount is an insult as a quest reward for such a time-consuming meta achievement. It flies and glides in a gangly fashion and although "chromatic", its skin looks very bland and uninteresting. The only terror it inspires is that of having to look at it while riding it. At least there's the Draenor flying skill attached to the achievement as well. This has to be one of the ugliest mounts ever. The textures are just terrible, and the art is awful looking. How did this get through testing? Will the mount still be obtainable after flying has been released? The lack of details on this mount is the only truly exceptional thing about it. This may be a bit nitpicky, but be careful with this mount if you go afk while flying to some far off destination - its "soaring" motion can cause you to go considerably off-course. It may not look like much, but I find the way it moves (the soaring/gliding animation) to be quite relaxing on medium to long travels. Hi all, first time post, How does one acquire the soaring sky terror? "The extra-light equipment on this chromatic rylak allows it to swoop and glide through the clouds easily, free from the bounds of the land below."